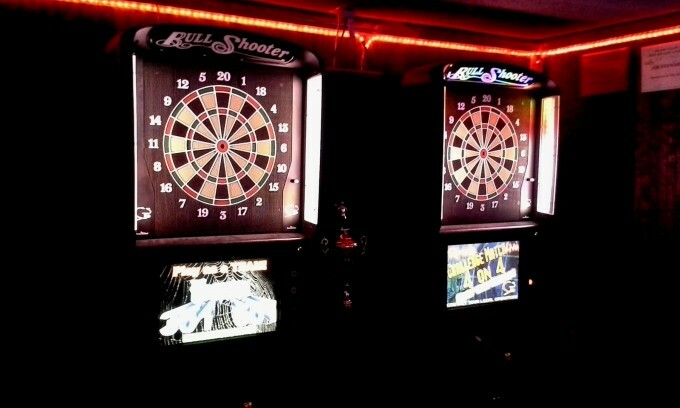 The Skydive Lounge in Riverside, California next to the Riverside Airport offers a dart tournament every Monday and Wednesday starting at 7:30pm PST. All players of any skills are welcome and the tournament is 15 weeks long. At the end of each season all players that have played for 2 full seasons will have an opportunity to go to Las Vegas or Laughlin for the end of the year Special Dart Tournament. The rules are simple the tournament is played in teams of 2 and a round robin style gaming that includes 501 and Cricket. After each round robin game and depending on actual game play you will be partnered with an opponent to play head to head. Each player gets a handicap and will regulate the equality based on that handicap for example; a top player in 501 will start off at 501 points versus a lower rated skill level player may start with only 350 points on a 501 game challenge. There is also a freeze rule which means if your teammate’s score is higher than both the opposing team score added together in 501 gaming then the partner player can not win or “go out” on the last dart. They will need to wait until that team mates score is less than both combined. For Example; the first team members A1 has 200 left on 501 and A2 has 50 points left but on the other team B1 has 100 points and B2 has 50 points then because the added score of both B team is 150 and A1 has more than that at 200 the A2 player can not win and if A2 goes out, it is an automatic forfeit on that game. This only relates to the 501 games. You can use any soft tip dart including the bar house darts or you can bring in your own custom, as long as they are for soft tip play only. – $10.00 annual fee for the whole year. If you have any questions please contact us on our contact us page or click here.